Born in 1923, deceased in 1997. Please help improve it by adding dated informations, images and videos about Roy Lichtenstein. His studies were interrupted by a three-year stint in the army during and after World War II between 1943 and 1946. In 1949 Lichtenstein received an M.F.A. degree from the Ohio State University and in the same year married Isabel Wilson, who previously had been married to Ohio artist Michael Sarisky. In 1951 Lichtenstein had his first solo exhibition at the Carlebach Gallery in New York. In 1954, his first son, David Hoyt Lichtenstein, now a songwriter, was born. His second son, Mitchell Lichtenstein was born in 1956. In 1957, he moved back to upstate New York and began teaching again. Lichtenstein began teaching in upstate New York at the State University of New York at Oswego in 1958. During the 1960s, his paintings were exhibited at the Leo Castelli Gallery in New York City and, along with Andy Warhol, Jasper Johns, James Rosenquist, and others he became a leading figure in the new art movement. In 1960, he started teaching at Rutgers University where he was heavily influenced by Allan Kaprow, who was a teacher at the university. Lichtenstein's derivative of van Gogh's original paintingIn the early 1960s, Lichtenstein reproduced masterpieces by Cezanne, Mondrian and Picasso before embarking on the Brushstroke series in 1965. His first work to feature the large-scale use of hard-edged figures and Ben-Day dots was Look Mickey (1961, National Gallery of Art, Washington, D.C.). In 1961, Leo Castelli started displaying Lichtenstein's work at his gallery in New York. In 1961, Lichtenstein began his first pop paintings using cartoon images and techniques derived from the appearance of commercial printing. Beginning in 1962, the Leo Castelli Gallery, New York, held regular exhibitions of the artists work. It follows the comic strip-based themes of some of his previous paintings and is part of a body of war-themed work created between 1962 and 1964. Leo Castelli Gallery represented Lichtenstein exclusively since 1962. Edward Ruscha - In 1962 Ruscha's work was included, along with Roy Lichtenstein, Andy_Warhol, Robert Dowd, Phillip Hefferton, Joe Goode, Jim Dine, and Wayne Thiebaud, in the historically important and ground-breaking "New Painting of Common Objects," curated by Walter Hopps at the Pasadena Art Museum. Wayne Thiebaud - In 1962 Thiebaud's work was included, along with Roy Lichtenstein, Andy_Warhol, Jim Dine, Phillip Hefferton, Joe Goode, Edward Ruscha, and Robert Dowd, in the historically important and ground-breaking "New Painting of Common Objects," curated by Walter Hopps at the Pasadena Art Museum . In 1964, Lichtenstein became the first American to exhibit at the Tate Gallery, London, on the occasion of the show "'54'64: Painting and Sculpture of a Decade". Lichtenstein began experimenting with sculpture around 1964, demonstrating a knack for the form that was at odds with the insistent flatness of his paintings. With the help of Universal Film Studios, the artist conceived of, and produced, Three Landscapes, a film of marine landscapes, directly related to a series of collages with landscape themes he created between 1964 and 1966. Most of his best-known artworks are relatively close, but not exact, copies of comic book panels, a subject he largely abandoned in 1965. This phase would continue to 1965, and included the use of advertising imagery suggesting consumerism and homemaking. In 1966, Lichtenstein moved on from his much-celebrated imagery of the early 1960s, and began his Modern Paintings series, including over 60 paintings and accompanying drawings. It was purchased by the Tate Modern in 1966, after being exhibited at the Leo Castelli Gallery in 1963, and has remained in their collection since. In 1967, his first museum retrospective exhibition was held at the Pasadena Art Museum in California. He married his second wife, Dorothy Herzka, in 1968. In 1969, Lichtenstein was commissioned by Gunter Sachs to create Composition and Leda and the Swan, for the collector's famous Pop Art bedroom suite at the Palace Hotel in St. Moritz. Lichtenstein began a series of Mirrors paintings in 1969. Lichtenstein had his first retrospective at the Guggenheim Museum in 1969, organized by Diane Waldman. Also in 1970, Lichtenstein purchased a former carriage house in Southampton, Long Island, built a studio on the property, and spent the rest of the 1970s in relative seclusion. By 1970, while continuing on the Mirrors series, he started work on the subject of entablatures. In 1970, Lichtenstein was commissioned by the Los Angeles County Museum of Art to make a film. The Entablatures consisted of a first series of paintings from 197172, followed by a second series in 1974-76, and the publication of a series of relief prints in 1976. Lichtenstein's Still Life paintings, sculptures and drawings, which span from 1972 through the early 1980s, cover a variety of motifs and themes, including the most traditional such as fruit, flowers, and vases. A notable example being Artist's Studio, Look Mickey (1973, Walker Art Center, Minneapolis) which incorporates five other previous works, fitted into the scene. Group 5 Racing Version of BMW 320i, painted in 1977 by Roy Lichtenstein. In 1977, he was commissioned by BMW to paint a Group 5 Racing Version of the BMW 320i for the third installment in the BMW Art Car Project. In the late 1970s, this style was replaced with more surreal works such as Pow Wow (1979, Ludwig Forum für Internationale Kunst, Aachen). Marys, Georgia; Mermaid in Miami Beach; the 26 feet tall Brushstrokes in Flight at Port Columbus International Airport; the five-storey high Mural with Blue Brushstrokes (198485) at the Equitable Center, New York; and El Cap de Barcelona in Barcelona. He discussed experiencing this heavy criticism in interview with April Bernard and Mimi Thompson in 1986. Lichtenstein became the first living artist to have a solo drawing exhibitions at the Museum of Modern Art from March  June 1987. In his Reflection series, produced between 1988 and 1990, Lichtenstein reused his own motifs from previous works. 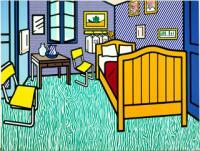 Lichtenstein's Bedroom at Arles , derivative of Vincent van Gogh original painting. In 1994, Lichtenstein created the 53-foot-long, enamel-on-metal Times Square Mural that now hovers over pedestrians in the Times Square subway station. The Guggenheim presented a second Lichtenstein retrospective in 1994. Gagosian Gallery has been exhibiting work by Lichtenstein since 1996. In 1996 the National Gallery of Art in Washington, D.C. became the largest single repository of the artist's work when Lichtenstein donated 154 prints and 2 books. Mart Tour and in an exhibition in 2007 at the British National Portrait Gallery. Dan Graham - Witt, Roy Lichtenstein, Robert_Mangold, Bruce Nauman, Claes Oldenburg, Kazuo Shinohara, Michael Snow, Mies van der Rohe and Robert Venturi. In late 2010 The Morgan Library & Museum showed Roy Lichtenstein: The Black-and-White Drawings, 19611968.